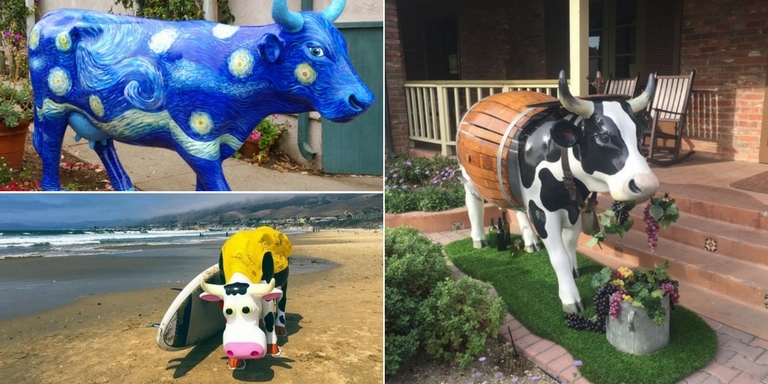 For the past 8 months, 101 fiberglass cows have come to call the Central Coast home thanks to Cow Parade SLO, the world’s largest and most successful public art event. Since September, each unique cow has taken up residency at a different business or organization, showcasing important regional values like art, agriculture, and ecotourism, including the Paso Robles Inn’s very own Clarabelle the Wine Cow! Now that visitors and locals alike have gotten familiar with the herd, the cows are being steered toward Santa Margarita Ranch for the live charity auction on Saturday, May 6th. The 25 colorful cows that are moving on will be auctioned off for charity at Ancient Peaks Winery’s Oyster Ridge on May 6th beginning at 3 p.m. Bidders from all around will enjoy a day of food, wine, beer, and auctioning featuring a Prime Rib dinner. In the meantime, you can get your bid in early because online auction pre-bidding is live! Thanks to the votes of loyal CowParade fans, the 25 cows that are moving onto the live auction include: Adventure Cow, Athena, Coastal Cow, Cow-a-fornia Cow, Cowvee Alice, Delft Cow, Electric Cream Dream, Every Child is an Artist, Jesse/Jane, John Cowe, Joie De Vivre, Media Moo, Mini Moo One, SLO MOTION, Moo Delo Tradiciones De Oro, Moo-zek, Moo’ving Thru the Decades of Agriculture, Mooovin’ Hands, Mini Moo: Peggy Moo, Picowso, See Cow Do, Starry Night Cow, The Vineyard Diva, Udderly Blessed, Wild and Free into the Night, and Cinnamon. Before coming to SLO, CowParade has been featured in London, New York, Paris, Rome, and 71 other cities and towns. Since its beginning in 1999, more than $30 million for charities has been raised by CowParade across the globe. In the past, cows have made between $4,000 and $150,000 at auctions around the world. 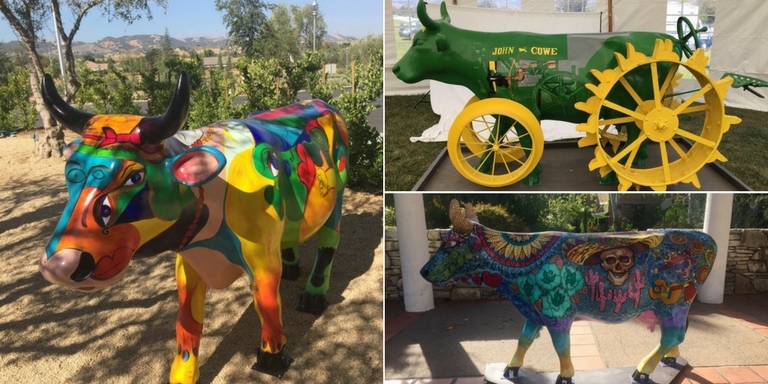 In an effort to draw attention to our area’s focus on the arts, sustainability, and agriculture, the proceeds gathered by CowParade SLO’s herd will benefit ARTS Obispo, The Land Conservancy of San Luis Obispo County, and the California Mid-State Fair Heritage Foundation. However, sponsors can also designate auction proceeds to a charity of their choosing. Cows like Clarabelle the Wine Cow, sponsored by the Paso Robles Inn, won’t be moving forward to the live auction because they’ve found their forever homes with organizations and businesses that have chosen to donate the money raised by their cow to the charity of their choosing. As one of these sponsors, the Paso Robles Inn will donate the money raised by Clarabelle to benefit the Children’s Museum in Paso Robles. The Children’s Museum is a public charity that provides developmental opportunities for local children and families. The donations aid the museum in creating and maintaining interactive exhibits that encourage children to play, learn, and enrich their childhood through participation in educational programs. Next weekend, be sure to visit Santa Margarita for an udderly great event! For more information, visit www.cowparadeslo.com!